Cristalrecord - Manufacturer and distributor of lighting products. 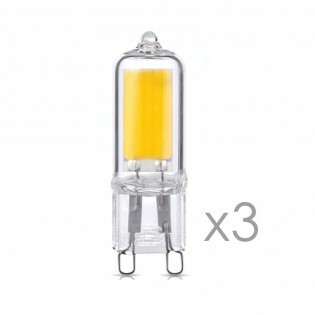 Pack of 3 capsule bulbs with G9 cap. Each with a power of 2.5 W, 250 lumens of intensity and warm or neutral color temperature. Choose the one that best suits the needs of your room. Manufactured in extra clear glass. Lifespan approximately 25,000 hours. Dimensions: Height 4.85 cm. Diameter 14.5 cm. 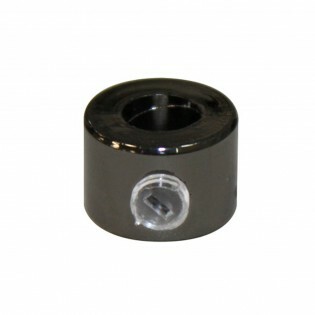 Cable holder in black colour. An accessory that will allow you to customize your lamp by modifying the cable with striking and different shapes. Ideal for vintage or industrial style lamps. "Saitama" is a Flush Light in a modern styleclear matt orange glass finish and chrome metallic frame. Ideal for kitchens or rooms in a modern style. Available in two colours (orange and black). Dimensions: Diameter 36 cm. High: 11 cm. Ceiling lamp with adjustable height for you to adapt it to the size of your space. Made of metal with available finish in aged gold or black. Place decorative light bulbs and you will get a vintage style lamp for dining rooms, living rooms, bedrooms...Dimensions: Height 38 - 65 cm. Width 60 cm. Ceiling lamp Globe manufactured of metal with chrome finish. It is made up of ten lighting points on metal bars placed at different positions and linked together. Its vintage style is ideal for dining rooms, living rooms, bedrooms... Adjustable height.Dimensions: Height 58 - 85 cm. Length 65 cm. Width 65 cm. 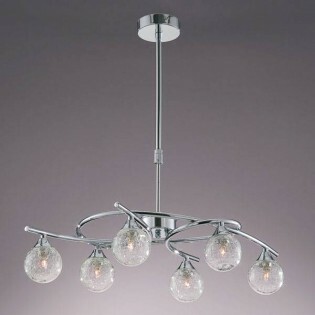 Ceiling lamp Globo with interlaced metal bars and six lighting points. Fully visible bulbs to give the lamp an unmistakable vintage touch. Ideal for general lighting of dining rooms, living rooms... Dimensions: Height 58 - 85 cm. Width 65 cm. Ceiling lamp composed of eight lighting points with interlaced arms that give it an attractive and groundbreaking aesthetic. Made of metal with a chrome and light bulbs finish completely exposed that give it a very characteristic vintage style.Dimensions: Height 58 - 85 cm. Width 65 cm. 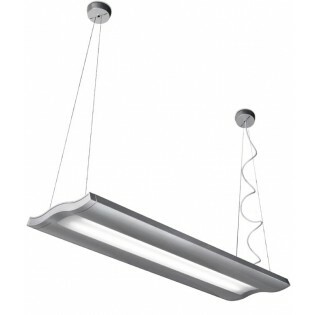 Ceiling lamp with integrated LED lighting of 30W. You can regulate the colour temperature in warm, neutral or cold to achieve different types of environments. 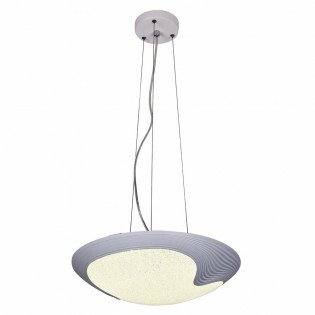 A modern design with an oval-shaped lampshade made of acrylic and a main metal structure. 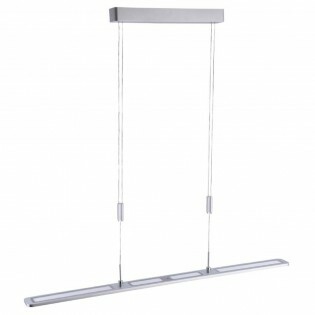 Ideal for illuminating rooms such as the dining room or bedroom.Dimensions: Height 120 cm. Diameter 48 cm. Ceiling lamp Jade with oval lampshade made of acrylic with metal structure and main frame. Ideal for dining rooms, living rooms... Integrated with 36 W LED lighting with a remote control to regulate the color temperature and light intensity. Dimensions: Height 100 cm. Diameter 50 cm. 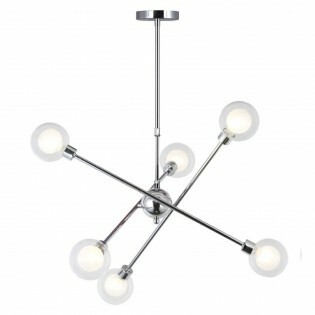 Ceiling Lamp in a modern style with 3 lights, with telescopic seat post for height adjustment. Made of wenge steel, red lampshade on linen paper (simulates rattan) and cream crystal lampshades. Perfect for living rooms in a modern style. Dimensions: Length 50 cm. High Lampshade: 16 cm. Height adjustable: 54.5 - 78 cm. Ceiling light of modern style 4 lights, with telescopic seatpost for height adjustment. 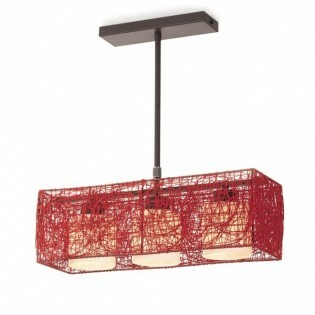 Made of wenge steel, red lampshade on linen paper (simulates rattan) and cream crystal lampshades. Perfect for living rooms in a modern style. Dimensions: Length 35 cm. High Lampshade: 16 cm. Height adjustable: 54.5 - 78 cm. 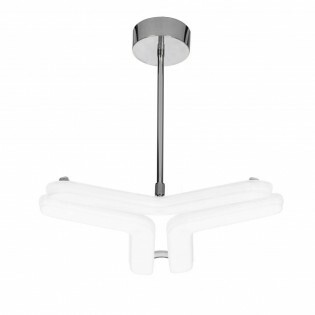 Ceiling light of modern style with 5 lights, with telescopic seat post for height adjustment. Made of wenge steel, red lampshade on linen paper (simulates rattan) and cream crystal lampshades. Perfect for living rooms in a modern style. Dimensions: Length 86 cm. High Lampshade: 16 cm. Height adjustable: 54.5 - 78 cm. 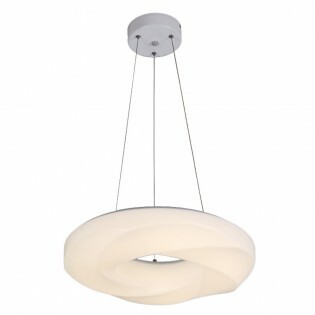 Ceiling light modern in a circular shape. Available in two colours to choose from: black or red. A Perfect lamp for dining rooms in a modern style, young people as well as bedrooms decorated in black. Dimensions: Diameter: 57 cm. Total Height adjustable: 20 - 220 cm. 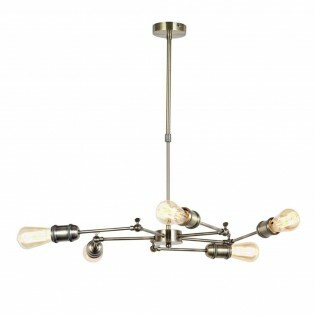 Ceiling light Atomic with lead color finish and twelve Lighting points. Perfect for placing Light bulbs of Vintage style (not included). It has a main structure made of metal ideal for your dining room, living room, bedroom.....is illuminated to the last. Dimensions: High 57-82 cm. Width 50-108 cm. 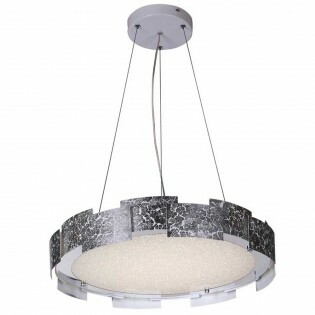 Ceiling light in a modern style from the collection Carolina. A Spectacular design made up of three spheres with a chrome finish and precious Floor Lampzas made of glass. It comes integrated with LED technology and driver perfect for lighting with a minimum consumption of bedrooms or living rooms. Dimensions: High 150 cm. Length 53,5 cm. Width 53,5 cm. Pendant light Carolina with main structure made of steel with chrome finish and three structures with rectangular design made of beautiful Floor Lampzas made of glass. Integrates Lighting LED for very low power consumption (driver included). Perfect for illuminating bedrooms or living rooms. Dimensions: High 150 cm. Length 56,2 cm. Width 56,2 cm. Ceiling light Gavi in is a Ceiling light in a modern style made in silver grey metallic structure and matt glass.Dimensions: Length 94 cm x 30 cm. Width. Maximum Height: 120 cm. 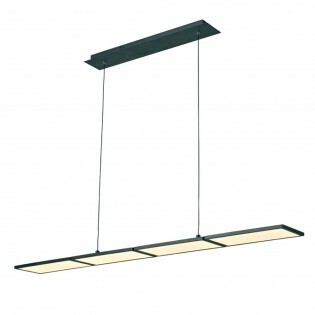 Ceiling light from the collection Boomerang with lighting LED integrated. It is made of PVC with a chrome finish and white Lampshade. LED driver included. It stands out for its design and modern style, ideal for lighting dining rooms, living rooms, bedrooms...Dimensions: High 10.5 cm. Diameter 50 cm. 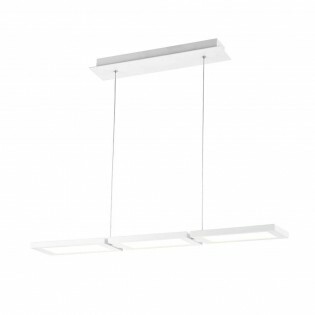 Ceiling light with four lights from the collection Estela with lighting LED integrated (LED driver included). It is made of aluminum and glass and finished in chrome. You can regulate the Height as you wish and place it in rooms such as the dining room, bedroom, living room etc.Dimensions: High 29-80 cm. Length 66 cm. Width 39 cm. Pendant light from the collection Estela. It has six LED light points that can be replaced. Structure made of aluminum with chrome finish and adjustable seatpost with Height. This classic style Lamp will help us decorate living rooms, bedrooms...LED driver included. Dimensions: High 29-80 cm. Length 67 cm. Width 61 cm. Ceiling light with lighting LED 20W. This Lamp has four light points that offer a wide Lighting range. The LED Lampshades can be replaced and we can also adjust the Height of the Lamp using the seatpost. It is Perfect for placing in bedrooms, living rooms, lounges...LED driver includedDimensions: High 80-29 cm. Length 66 cm. Width 39 cm. Ceiling light from the collection Or. It is made of aluminium with integrated lighting LED, an innovative technology that will allow you to save on your electricity bill. LED driver included. Its style adapted to the latest is perfect for lighting dining rooms, living rooms... Dimensions: Width 76 cm. Ceiling light with lighting LED built-in of 72 W to illuminate completely your dining room, living room, bedroom....decorated with a modern and modern style. It has a rectangular design made of aluminium and finished in white. LED driver included. 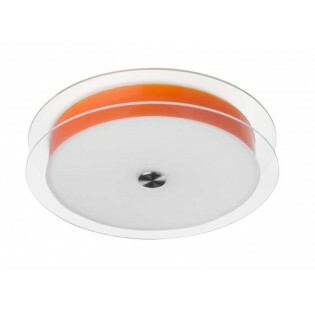 Ceiling light Wanda with a choice of white or grey finish. A design in a modern and modern style with fine and simple lines ideal for decorating rooms such as the dining room, bedroom, etc. Made of aluminium with LED driver included.Dimensions: High 55 cm. Length 102 cm. Width 9,8 cm.